In fact, the program has been so successful, NYP plans to expand the telehealth service to NYP Lower Manhattan Hospital. 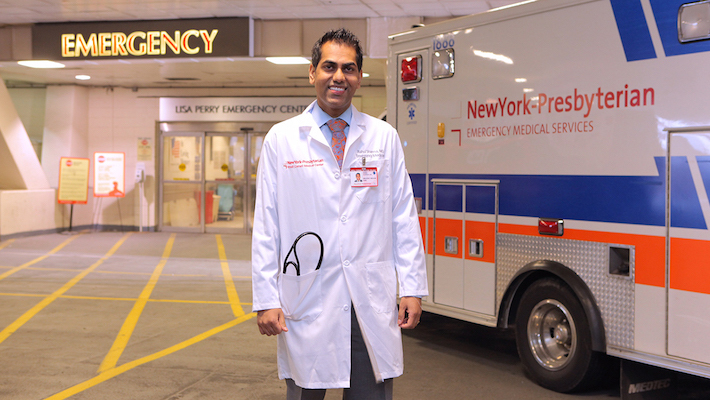 The goal was to provide another safe and efficient option for patients in the ER with minor complaints, such as a cold or a wound, according to Rahul Sharma, MD, emergency physician-in-chief for Emergency Medicine at Weill Cornell. Initially, patients with minor complaints would have to wait for about two hours, Sharma explained. Today, they’re added to a fast track area. Regardless of the condition or ailment, all patients go through a formal screening process, Sharma said. There is a tight list of criteria that would allow a patient to move into the separate room to see an NYP provider via a telehealth monitor. All telehealth providers are from NYP, board certified and formally trained, he added, the front end staff is also trained on how to screen for the appropriate criteria for the fast-track area. And feedback from patients has been “overwhelmingly positive,” he said. Initially, the hours of operation began with four hours, which the organization hopes to move into six hours and eventually 16 hours of coverage. Not only does NYP plan to expand the program at its main site, it also plans to expand the program into its other campuses. And that’s just phase one. The success of the initial stage has prompted NYP to think about building an on-demand service app that patients can use to call from home – instead of heading to urgent care or emergency department.